I can't believe we are half way through the month already! 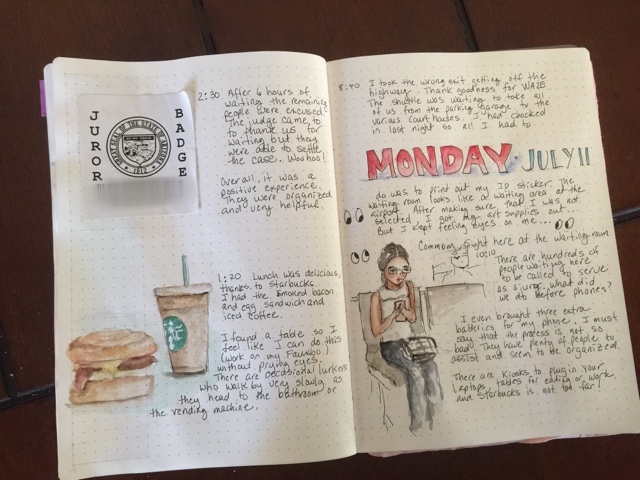 This past week for me was getting back to my "roots" and doing more journal art rather than art pieces. And as much as I love seeing others' works, I found myself trying to create pieces that others would appreciate or acceptable rather than what I find inspirational. So I'm trying to learn from others but apply the learning to my style, if that makes sense. So here are the pieces from this past week! I had jury duty on Monday so I took my art supplies with me to pass the time. Good thing too, as I waited 6 hours and being excused. Luckily, I won't have to appear for at least 18 months. I found I don't like people staring at me while I painted. It's natural for people to be curious, but I kinda had performance anxiety.. Lol. 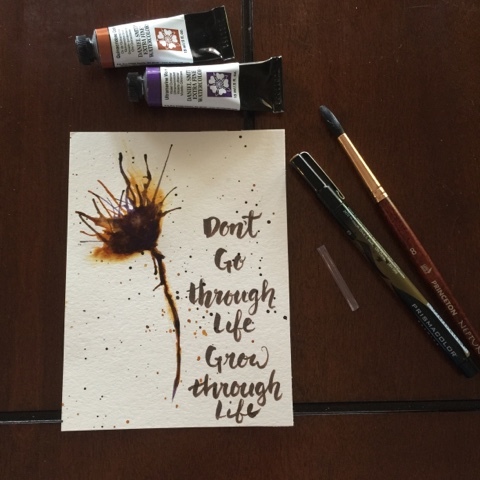 So if you have been following my art process, you know I usually start with a quote. 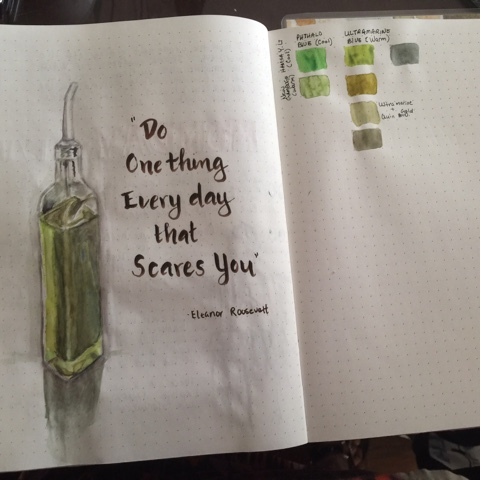 I thought about things that scare me artistically.. There lots of things of course but I chose painting glass. It's difficult because of caustics (how glass reflects and refracts light) and dealing with different shadows and highlights. So I tried painting my olive oil carafe. I think for the most part I was successful. Green is so hard to render. Most greens that come in a kit or you buy are bright Christmas green and that's not what most greens in nature are. So you have to mix. What I found helpful is a YouTube video by Teoh Yi Chie about color mixing. So I used his method of using the color temperature to mix my greens. Today's focus was people. 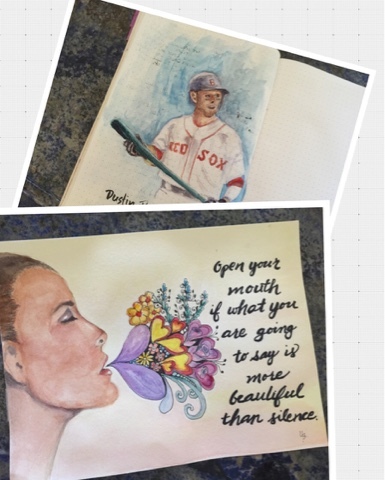 In my journal, I painted Dustin Pedroia, the second baseman of the Boston Redsox who happens to be my son's favorite player. The night before was the All-Star game and though Dustin was not chosen, I wanted to try to paint him. 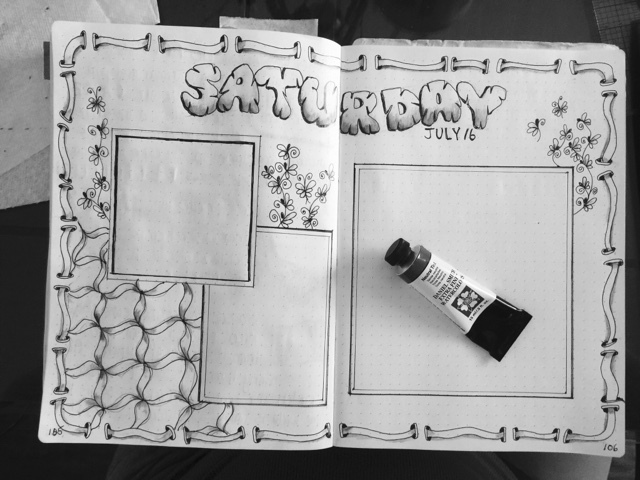 The second piece was done in my journal last year but I wanted to do it on a larger sheet so I can have it printed. I've been playing with creating skin tones so this was a great exercise. I'm liking Perylene Maroon as my red for skin tones. 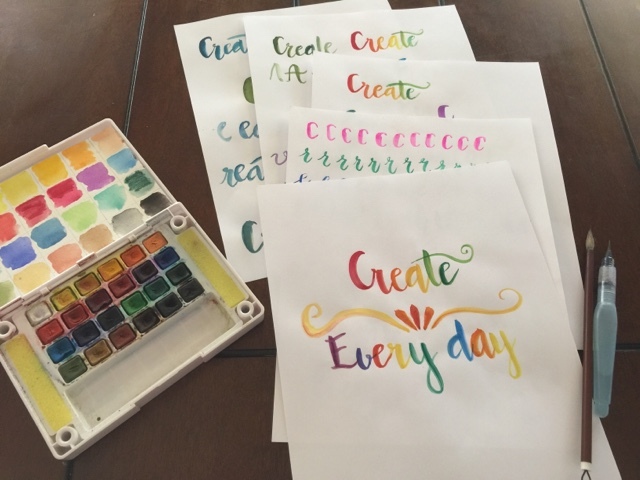 I practiced brush lettering with watercolors. 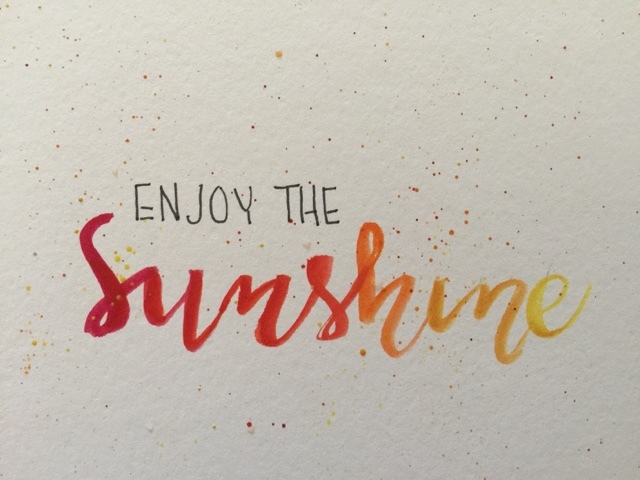 Brush lettering with brush markers is hard enough but trying to use watercolors and blending the colors is really hard. So I practiced and created this. 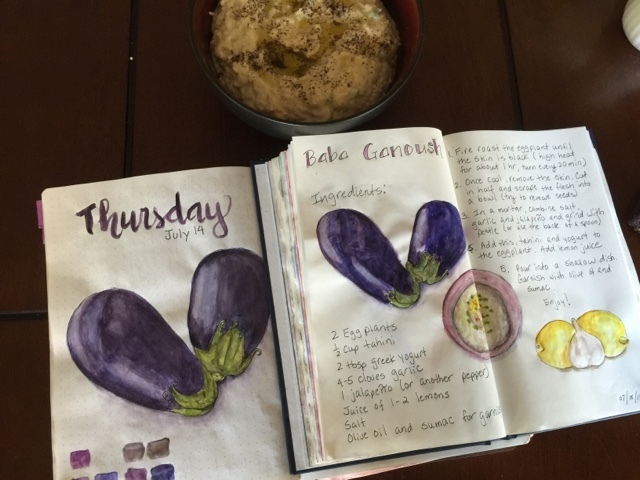 I had drawn a pair of eggplants in my journal the day before because I made baba ganoush which is a creamy dip made from roasted eggplants. And for day 15, I thought I'd created an illustrated recipe spread. Though both sets of eggplants look good, Ibreally liked the first better - I thought the color and the reflection were better in the first. 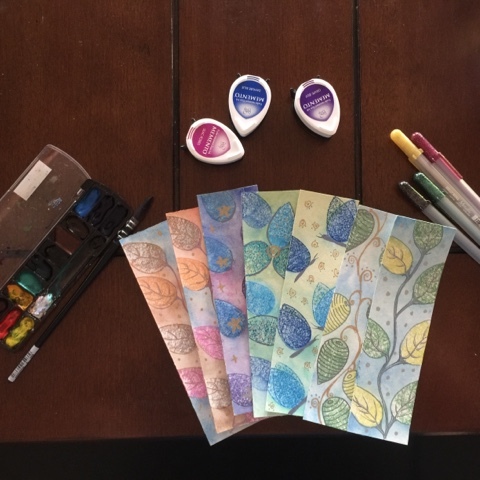 Here is a spread with lots of zentangle patterns and shaded with Neutral Tint (watercolor paint that is grayish). It's so much easier to shade with paint than with a pencil and a blending stump! I used two colors, Quinacridone Gold and Ultramarine Violet and a straw to create this piece. I used water to create the flower shape and dropped quin gold and used the straw to blow. While wet, I dropped ultramarine violet. Together, they make mud, or a cool brown. Once dry, I dropped more violet so you can see a bit of the violet. 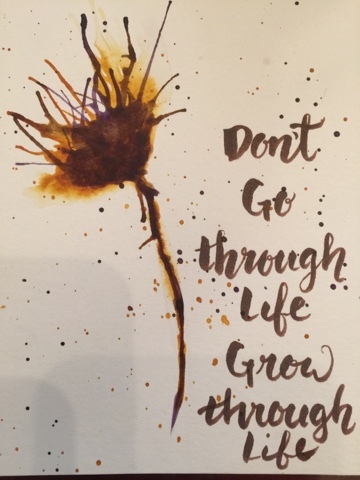 I've been holding on to this quote for awhile and thought perfect with this painting. But I almost ran out of space! This month so far has been so fun. I actually have to start planning for the upcoming school year next week and I actually have to go back to work the last week in July! I'm so happy that I got to spend time creating again. Hope you all have a great week!